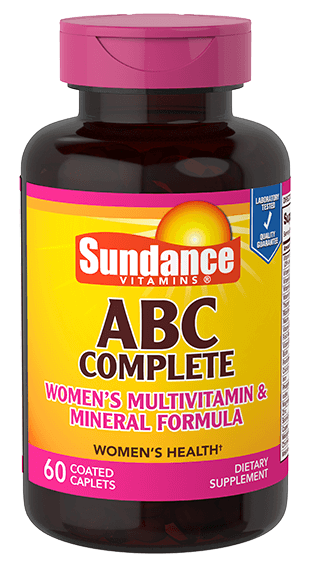 Sundance Vitamins® has specially formulated this multivitamin, specifically designed for women, to provide the essential nutrients you need. Ingredients: Calcium Carbonate, Magnesium Oxide, Potassium Chloride, Dicalcium Phosphate, Ascorbic Acid, Cellulose (Plant Origin), Maltodextrin, Ferrous Fumarate, Contains 2% or less of Ascorbyl Palmitate, Beta-Carotene, Biotin, Carboxymethylcellulose Sodium, Cellulose Coating, Cholecalciferol, Chromium Picolinate, Cupric Sulfate, Cyanocobalamin, d-Calcium Pantotenate, dl-Alpha Tocopherol, dl-Alpha Tocopheryl Acetate, DL-Tartaric Acid, FD&C Blue No. 2 Lake, FD&C Red No. 40 Lake, FD&C Yellow No. 6 Lake, Folic Acid, Gelatin, Glucose, Gum Arabic, Manganese Sulfate, Medium Chain Triglycerides, Nickel Sulfate, Nicotinamide, Organic Guar Gum, Organic Palm Oil, Organic Sunflower Lecithin, Phytonadione, Polydextrose, Polyethylene Glycol, Polyvinyl Alcohol, Potassium Iodide, Pyridoxine Hydrochloride, Retinyl Acetate, Riboflavin, Silicon Dioxide, Sodium Ascorbate, Sodium Benzoate, Sodium Metavanadate, Sodium Molybdate, Sodium Selenite, Sorbic Acid, Stannous Chloride, Starch, Sucrose, Sunflower Oil, Talc, Thiamine Mononitrate, Titanium Dioxide Color, Tricalcium Phosphate, Vegetable Magnesium Stearate, Zinc Oxide.